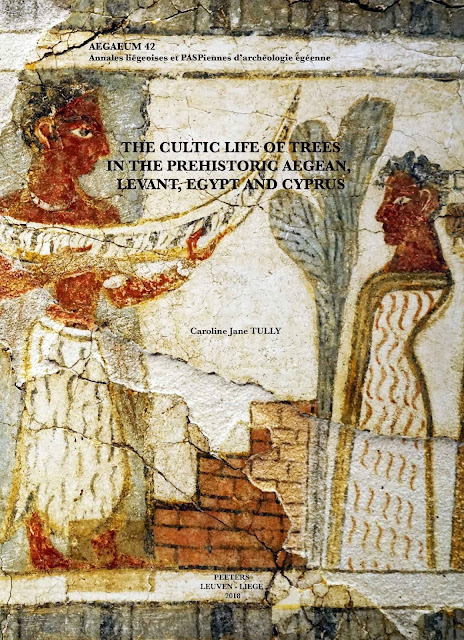 This is my new book, The Cultic Life of Trees in the Prehistoric Aegean, Levant, Egypt and Cyprus. Published by Peeters: Leuven. It is 314 pages, and its dimensions are 30 cm x 21 cm. This research examines 44 images of Minoan tree cult as depicted in sphragistic jewellery, portable objects and wall paintings from Late Bronze Age Crete, mainland Greece and the Cyclades. The study also compares the Aegean images with evidence for sacred trees in the Middle and Late Bronze Age Levant, Egypt and Cyprus. The purpose of this investigation is the production of new interpretations of Minoan images of tree cult. Each of the chapters of the book looks at both archaeological and iconographic evidence for tree cult. The Aegean material is, in addition, examined more deeply through the lenses of modified Lacanian psychoanalytic modelling, “new” animism, ethnographic analogy, and a Neo-Marxist hermeneutics of suspicion. It is determined that Minoan images of tree cult depict elite figures performing their intimate association with the numinous landscape through the communicative method of envisioned and enacted epiphanic ritual. The tree in such images is a physiomorphic representation of a goddess type known in the wider eastern Mediterranean associated with effective rulership and with the additional qualities of fertility, nurturance, protection, regeneration, order and stability. The representation of this deity by elite human females in ritual performance functioned to enhance their self representation as divinities and thus legitimise and concretise the position of elites within the hegemonic structure of Neopalatial Crete. These ideological visual messages were circulated to a wider audience through the reproduction and dispersal characteristic of the sphragistic process, resulting in Minoan elites literally stamping their authority on to the Cretan landscape and hence society. Amazing! I will look for it! I am a scholar of ancient religions and have recently completed a PhD on tree worship in Late Bronze Age Crete, Cyprus, the Levant and Egypt.